The word “turnkey” is, according to Collins Dictionary, rarely used. Except in my world. Hello, my name is Karen, and I’m a turnkeyaholic. Context, especially physical environment, has been important to me as far back as age six. My version of playing school involved perusing the Sears Christmas catalogue, making lists of what I would purchase to design and stock a classroom. When I actually became a teacher, I happily spent a chunk of my salary each year to have my environment support my work. If you’re thinking couches, area rugs, and framed art prints in the classroom you’ve got the idea. I believe that productive work environments are well-organized, well-stocked, inspiring places and that every tiny detail must be in place before I begin to use that space. That’s the definition of a turnkey project: one where when the key to a business is turned over to the new owners, they can simply walk through the door and begin to work. That level of obsessive attention to every detail is a great skill set to have if you’re a contractor or an event planner. But for an individual, it can be a seductive form of perfectionistic procrastination. I am, both proudly and sadly, Olympic-calibre when it comes to clearing the decks and getting ready. The long history of my art studio is a perfect example. 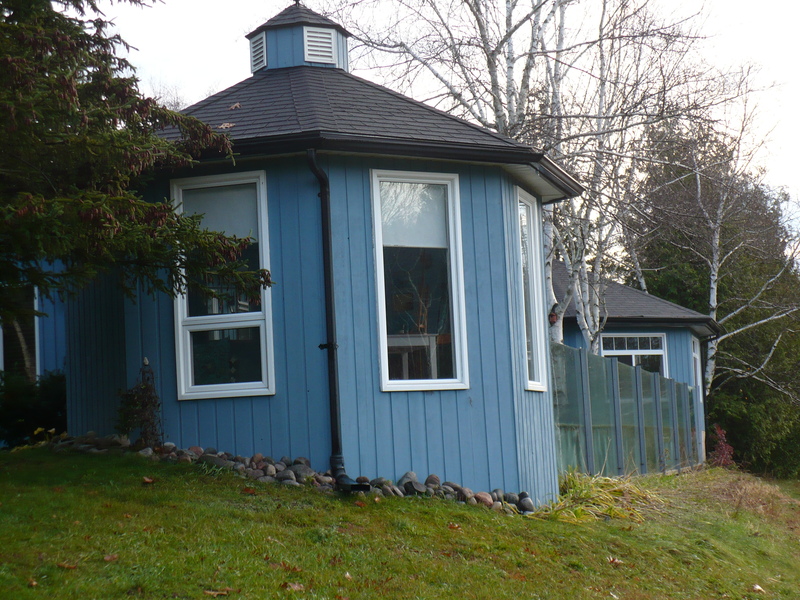 My art studio is an octagonal-shaped building, located at one end of a deck overlooking my pond, about a dozen steps from the sliding patio door in the living room. It’s fourteen feet in diameter, with floor to rafters windows on four of the eight walls. In the winter, the studio is quickly and easily heated by baseboard electric heaters. In the summer, there’s an air exchange system in the roof, plus one window and a screen door can be opened. The art studio was actually first built for me as my writing room. I wrote many books in there; the time and attention I put into creating a great writing space was easily justified. A nice view and a table where I could spread out post-it notes and reference materials made this the perfect spot for me. 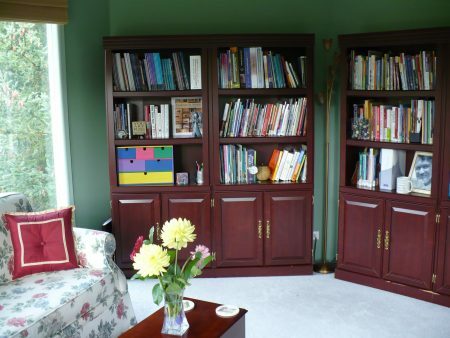 When I had the opportunity to move my writing room/library into the house, I jumped at it. It was easier to get decent Internet service and I had more room for books. 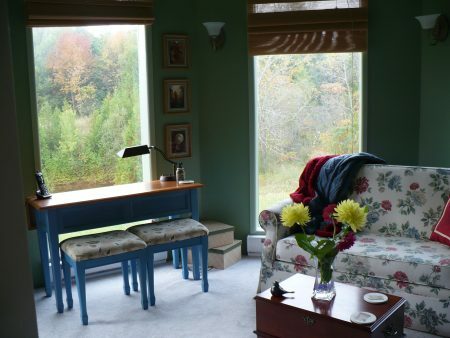 My little writing room became a ‘studio,’ a deliberately vague term because, to me, artists were special people, gifted from birth with talents I could only wistfully admire from afar. I used my studio sporadically for many years. Occasionally, I’d go out there to write in my journal. For a while, it was a meditation space. 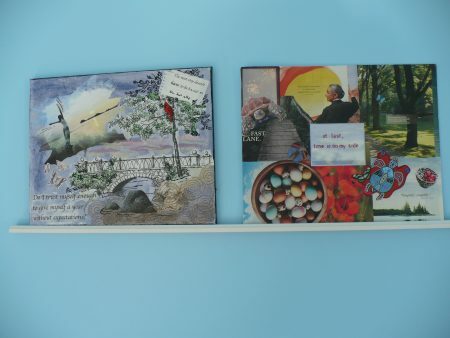 I dabbled ever so briefly with painting or making collages, but most of the time it sat empty. 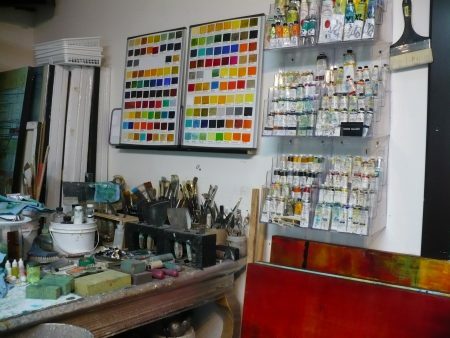 One of my all-time favourite autumn activities is to tour the studios of local artists. I am inspired, and sometimes overwhelmed, by the spaces where the pros do their work. When I see art that I love coming from a messy studio, I worry. Am I too tidy to just let go and be creative? I love the idea of an inspiration wall. This one is from the studio of a woman who paints designs on pottery. Last weekend I visited the art studio of my teacher, Rod Bergeron. I like studios with a view, easy access to books, and Rod’s practice of working out ideas in his sketchbooks. My decision to live RAW NEWS and, therefore, to work/play at art, is a very big step for me. It means I have to stop reading and dreaming about art; stop talking about what I will do, and actually do it. For me, of course, that means a highly enjoyable preparatory period of making my art studio turnkey. So I visited the studios of pros, gawked at beautiful studio spaces on Pinterest, and made notes about how I could best set up my little space. I’m done. I have no more excuses, no more stalling tactics in my repertoire. So let me take you on a tour of my art studio, a place where, as of November 1st, I have started spending time almost every day. This is the place of creative incubation. At first, you may find nothing happens there. But, if you have a sacred place and use it, take advantage of it, something will happen. A likeness of George Bernard Shaw hangs by the door. I know he’s not a visual artist. But he was a writer, and he was made by my friend Bob (of the stone therapy post). Perhaps most important, he’s a tribute to the previous owner of my home whose father was actually a friend of Shaw’s. On your immediate right as you enter, you’ll see a large whiteboard, my inspiration wall. The name “Profound Journey” came from this wall. Months before starting my blog, I’d grabbed a handful of magnetic words and tossed them on the board. One phrase — “profound journey please”–appealed to me so I left it there. When trying to think of a name for my blog, I turned my head, saw the phrase, and the rest, as they say, is history. This really great cabinet is below the whiteboard. 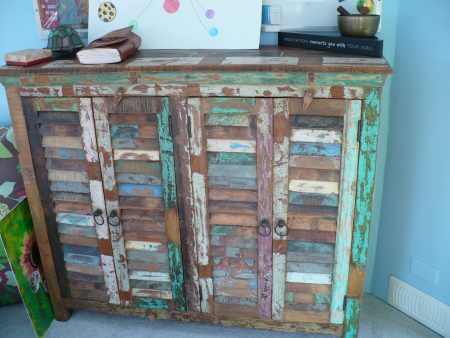 It came painted like this; I can’t imagine anything more perfect for an art studio. 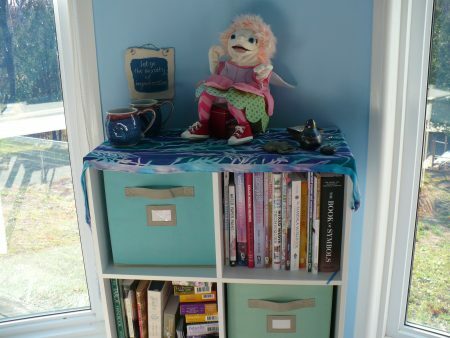 It holds all of my paints, pencil crayons, pastels, markers…. I like using flat art boards, but there’s no easy way to hang them. So I glued a piece of decorative molding to the wall. It works like a charm. Under the ledge you’ll find a couple of huge floor cushions (yes, I occasionally nap on them); a really comfortable chair (I love the circle motif); a colourful throw that my mother made as a blanket for a baby but that I insisted on keeping; a trunk holding watercolour paper, mixed media pads and the like; a CD player and container of CDs that I almost never listen to because I like silence, and a few stuffed toys. The dragon is Figment of your imagination from Disney. Tigger’s there as a symbol of exuberant commitment, and the duck is for that incessant quacking voice in my brain that tells me I can’t make art. Notice that the duck looks dead. That’s intentional. 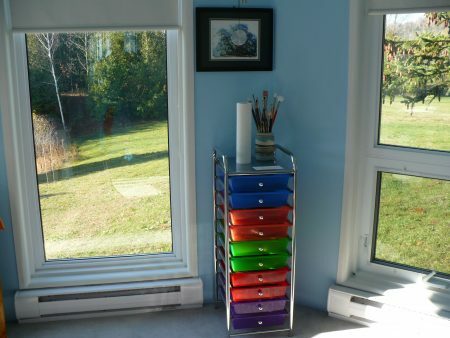 There’s a window beside the comfortable chair (if you could look out it and down the hill, you’d see my labyrinth), then one of two multicoloured drawer units that I use to store collage materials sorted by theme. There’s a chakra wind chime slightly obscuring an art print of the oldest tree in the United States – a tree I saw when visiting Fran K. and her husband on their first international school assignment in Charleston, South Carolina. 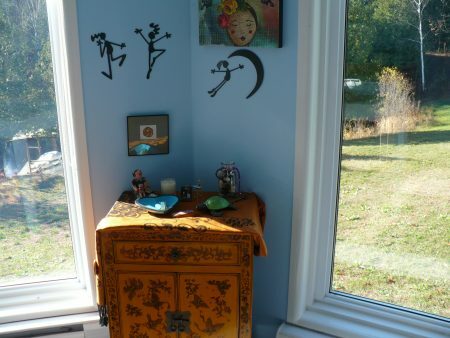 Moving along the wall – the window on the right is the one you saw on the left in the previous photo – we come to a little Chinese cabinet that holds candles, a meditation cushion I almost never use, and a singing bowl (ditto). On the top are symbols that matter to me. Some are a bit difficult to see in the photo but they include: a storytelling doll from New Mexico; a scented candle; intricately detailed miniatures of an artist’s supplies; a jar of colourful gems; a sea turtle; a little wooden box, and a gorgeous blue heart-shaped bowl with a couple of crystals. The tapestry knot image above is the Celtic symbol of death and rebirth. The black metal figures are ones I bought years ago because I loved their exuberant natures. The collage print that you can only see part of says “Explorer of Truth and Beauty”. Out the window to the left you can spot the dock area of my pond and the pedal boat we didn’t use even once this summer because we were busy or it was windy and rainy. The next section of wall is taken up with a bookcase, my favourite ‘studio mugs’, a sign a friend gave me (“let go the anxiety of imperfection”) whose message has not yet taken hold but I live in hope, and Idea Girl. Idea Girl is my embodiment of ideas (see Elizabeth Gilbert’s book, Big Magic). We’re almost out of walls. This last large wall faces out to the deck so there are no windows. Here you’ll find some of my favourite quotes; a mat and supplies for precision cutting; a container of decorative Washi tapes, and an antique Chinese cabinet that holds large papers, clay, a brayer for printmaking, and anything that won’t fit anywhere else. Even larger papers and canvases are stored behind the cabinet. To the left there’s another multicoloured paper storage unit, a stuffed monkey (for monkey mind – same idea as the duck) and then the door where we came in. And finally, in the center of the octagon, a table that used to be covered in plastic shower curtains from the dollar store until I decided that getting paint on the white surface would actually be a sign of progress. And a colourful rug because getting paint on the grey carpet wouldn’t! I know that I’m very fortunate to have a dedicated space for creative work and to surround myself with meaningful and personally inspiring objects. I feel the responsibility of not squandering this opportunity. It’s time for me to do what I’ve always said I wanted to do, and learn how to be creative in some visually artistic form. I’ll keep you posted. 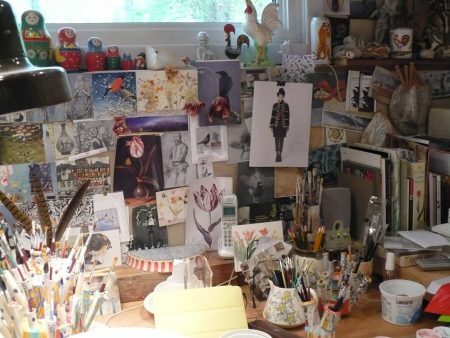 Your studio looks like something out of a magazine Karen; it must be a joy to create art in such a place – warm, inviting and beautifully decorated. You’re fortunate to have such a haven while you search for your “voice” in paint. Thanks, Anna. I love the idea of searching for my voice in paint. What a great phrase! Your studio looks so warm and inviting! I feel the creative juices flowing in me as I look at it! I love your paint holder and your colour pallet! Thank you, Deb. 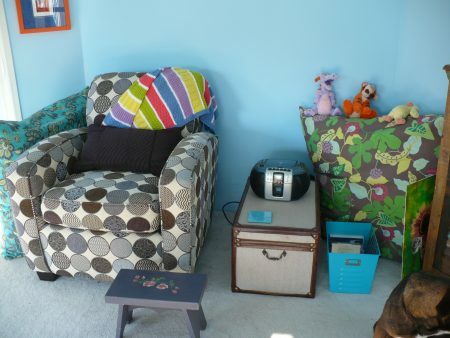 The wall colour is Benjamin Moore’s ‘Honolulu Blue.” It reminds me of icecream parlours. There’s a softer cloud blue on the ceiling. I too love the paint cabinet. I so appreciate your comment, Deb. Thanks again. I understand what you mean by turnkey! That is fabulous, I have serious envy. However, what I would want is the room as it was in its writing incarnation. I can imagine curling up with all those books, shutting everything else out and getting peace to read them. It really was a great writing room, Anabel. In a future post, I’ll show you my library in the house. It’s pretty awesome, otherwise I would never have been able to give up the writing room for another purpose. Wow. Just wow. I love your space – inspiring, personal, light filled. It’s making me re-look at my own – which is still full of unpacked boxes. And I’m thinking I need to be more choice-ful in what stays and what goes. P.S. this is my second attempt to post a comment. Not sure why last one didn’t process… but if it happens again, I’ll let you know, incase it’s a recurring glitch. Thanks for persisting with the commenting, Pat. This one came through fine so hopefully all will be well in the future. Glad you like my space, Pat. 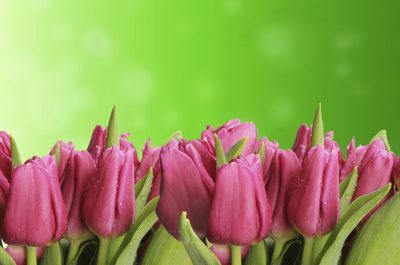 It’s wonderful that you have a wide open palette of possibilities in your own new space. Can’t wait to hear what you do with it! 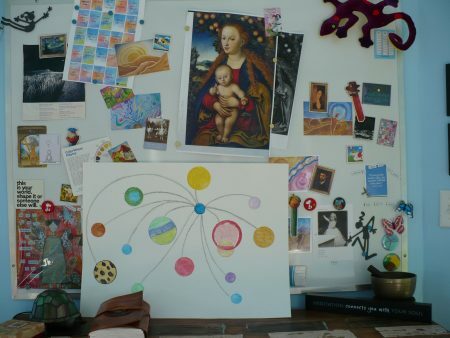 Wow Karen, your art studio looks like heaven to me. A space all your own and materials at the ready with your favourite things around you = heaven! The duck looking dead is intentional- that made me laugh. 😄 I also love that Gumby and Pokey are just hanging out by your phone. I remember watching them on tv 📺 way back in the day. Are you still enjoying your art classes? Thanks, Susan. Your message reminds me of those rebus books that are made for kids. Love the tv and phone icons. I’m loving my art classes. I’ll be writing about them very soon, maybe even next week. Thanks for responding en route; that’s dedicated of you! Now you are ready to “Ready, Fire, Aim!” I can hardly wait to see what artwork you produce in this beautiful spot. It seems like the organization and thought behind this studio is a piece of art in of itself. Enjoy. Thanks, Fran. Ready, Fire, Aim is exactly what this needs to be – as you know from your work, acting before planning often gives us the best results. Karen, your Art Studio is indeed a work of art. I admire how you have put your soul and passion into this – and planned every detail. I know that many forms of Social Media are not currently your thing. However, this post was too inspiring not to share further. Your Social Media buttons work quite quite well (I just tried them out). For the comment – if I check the box will I get notification of replies only to my comments, or of all comments on this post? If the later, there are several WP plugins that you can add that only notify the commenter of replies on his/her specific comment. Thanks, Donna. And I appreciate you testing out the social media share buttons. If tribe members like the sharing, I’m certainly not going to object! I’ll talk with Shiraz to see about limiting the notifications to replies just to the comments. Some of the plugins I have interfere with each other, but hopefully Shiraz will be able to work his magic. Hi, Karen – Shiraz is already ahead of us. I received an email notification that you had liked/replied to my comment (and I never checked the box). This is perfect! Thanks so much! Excellent! I’m delighted. Thanks for letting me know, Donna. Hi Donna, great art studio, isn’t it? I agree about sharing on social media…I mean how else are other women going to find this goldmine, am I right? I too shared it using the Pinterest button and the Twitter button I can answer the checking the box to get notification of replies question for you. I checked it and *bing* got an email when you wrote your comment. Your comment is straight in line with the others so it was not a direct reply to my comment. Saying all of that just to say this, check the box and you will get notified of all comments on the post not just replies to your comments. Thanks for answering Donna’s question, Susan. I’m going to see if Shiraz can refine the notification so it’s just to the comment that was made, but there are so many plugins that don’t play well together and it may not be possible. Fingers crossed. I just lost my long comment, so I am going to keep it short this time. Just love what you have created, Karen. Very inspirational and personal. I think all of us are pretty jealous of your little woman “cave”. If it would be mine, I’d be in that peaceful environment every day to write. As a matter of fact, I might turn our camper in a personal studio for myself (without the decorations and materials) after seeing all you created. No excuses not to create anymore, I agree! Did the book “Big Magic” inspire any of this? I just finished reading it. Happy painting!! Oh no about losing your long comment, Liesbet. I hope it wasn’t a problem on this end? Thanks for your thoughts and your good wishes. Hey, why not make the camper your personal studio? After all, it’s sitting there in the driveway when you are housesitting! 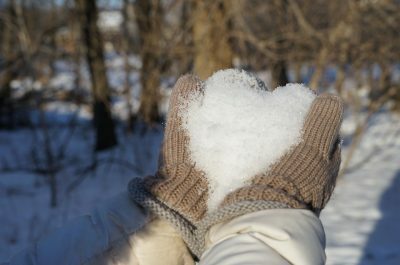 I imagine it would get lonely if you were out there all day long, but for even a couple of hours of concentrated work, it could be just great. I definitely found Big Magic a really inspiring read, but I read it a year or more about and don’t remember a lot. I think I’m feeling inspired to reread it. 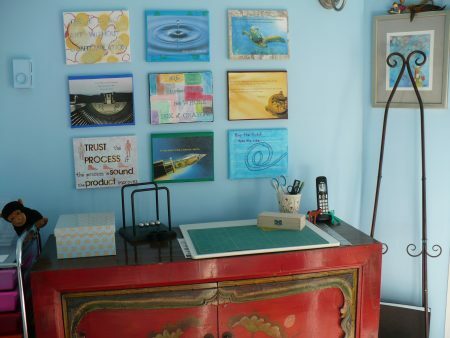 A beautiful art studio that you’ve created for yourself, Karen! I’m sure it will inspire you to paint, day dream, or whatever makes you feel happy. Thanks, Natalie. My studio is indeed inspiring me. And, more important right now, writing about the studio and my intentions is making me accountable for acting on that inspiration! omg – I LOVE your studio! Just having a room without 4 square corners is a novelty! I wish you many happy hours in connecting with that inner creativity! Thanks, Joanne. You know, I never thought much about it, but you’re right – the octagonal shape of the building is indeed a neat, quirky novelty that echoes the kind of creative work that I hope will go on in that space. I have serious studio envy! That’s the sort of place that would inspire creativity just by being there. You got me to thinking about some lower levels we have on our property that aren’t being used… hmmmmm. I hope you will share all the creative wonderfulness that is sure to come out of you and your magical octagonal. Oh I hope you will access some space in those lower levels for your creativity, Janis. 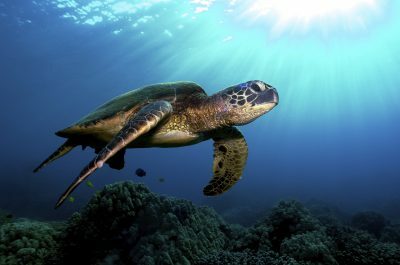 Because you are so right – environment can be hugely inspirational. I will definitely share my efforts. By the way, love “magical octagonal”. Oh Karen, you design such beautiful spaces! 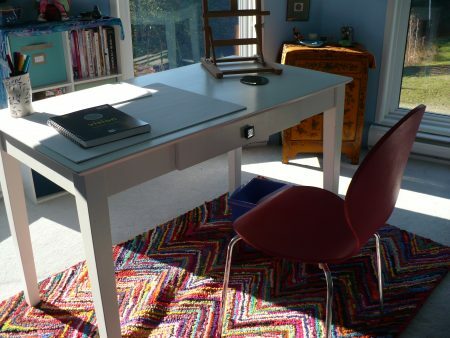 Your labyrinth, your writing room, and now your art studio! I imagine that your books and workshop materials also were beautiful. 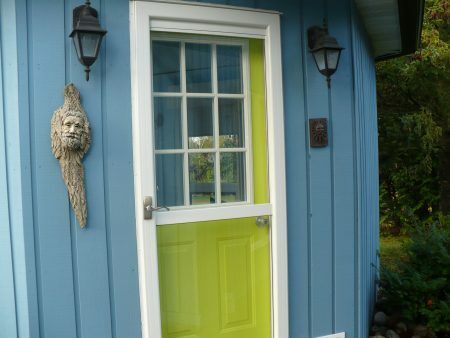 It seems to me that designing your art studio has been a wonderful way of expressing your creativity. p.s. I still have to input my contact details every time. Thanks very much, Jude. You are absolutely correct that I find designing spaces/books/workshop materials a really satisfying way of being creative. Thanks for letting me know you still need to input your contact details. Shiraz is working on it. If you could, please let me know how it is after the next comment or two, I’d appreciate it. Thanks. 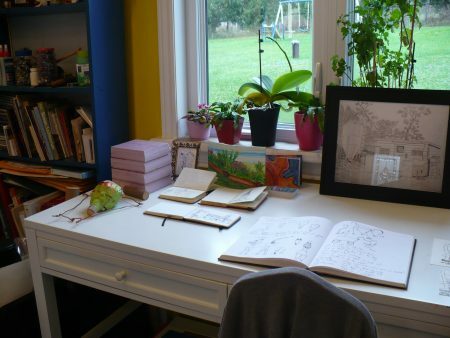 Your studio is lovely – and, yes, very neat! Lol. Mine is always a disaster. I envy your space and views. Happy creating. I was just on your site. Wow do you have a LOT of fabric! I like your creative space. Have you made the progress you wanted to make with it? Any recent pictures? By the way, I also love the leather purse with the map background. Gorgeous!